Augmentation of the brow bones has been done by a variety of materials and surgical approaches. Over the years I have evolved to doing brow bone augmentation using custom design implants placed through an endoscopic approach. This provides the greatest amount of complete brow bone augmentation with the least amount of incisional length to do so. One rare but alternative option is the use of a direct brow bone implant. I had a patient who wanted just tail of the brow bone augmentation and coincidentally had a well healed fine line scar right at the brow from a previous direct brow lift. Since her augmentation needs were small, I used a standard tear trough implant given its small size and curved shape. 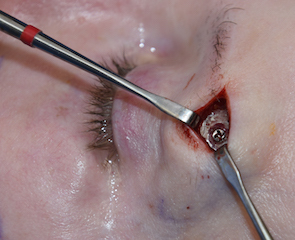 With some intraoperative modifications of the implant and use of a portion of her existing brow scar, the brow bone implant was placed directly in a subperiosteal pocket. A single screw was used for fixation. The more typical approach to placement of tail of the brow bone implants are going to be done through a transpalpebral or upper eyelid incision. This places the incision in a location which heals in virtual scarless fashion. But in this case the existing scar over the brow made this the incisional access of choice. Tail of the brow bone implants are for those who seek a more prominent lateral brow ridge. This is more common in men than women who often seek greater brow bone coverage of the eye. It is much less common requested in women who often are going in the opposite direction of tail of the brow bone reduction. But some women do seek a slightly more skeletonized look to the outer eye ridge and a few millimeters of bone augmentation is all that is needed.